The fashion designer is the key persons responsible for bringing stylish clothing. Although the style is based on region, culture, religion, and individual choices. But there are many things, a fashion designer can offer by using their creative mind. Many people born with a talent for designing. And many people learn through the academic process. You may find several institutions around the world who are offering fashion designing degree. To become a successful fashion designer, you will be required special qualifications. Either you born with these qualifications or you adopt from different means. According to our research if you want to become a fashion designer then you will be required to have 12 Qualities of a Fashion Designer. A fashion designer can also work as a fashion merchandiser. A successful fashion designer goes through many critical processes and attains some core qualifications which actually works behind their success. Trends in fashion always changing which is part of our lifestyle. As a fashion designer, you must concern and keep an update of change in fashion trends around the world. So that you can develop your own ideas and design. Offering fashionable clothing based on market demand is a challenging task. If you can successfully provide a design which meets the expectation of your apparel items, then you must get appreciation. Whatever you do, communication is necessary. Good communication not only helps to interconnect but also manage business dealings. As a fashion designer, you may have to communicate with your customers, wholesaler, retailers, outlets, fashion house etc. Both oral and written communication is required for a fashion designer. A critical thinker always tries to bring new design, ideas. Successful ideas actually push the market trends of fashionable cloth. 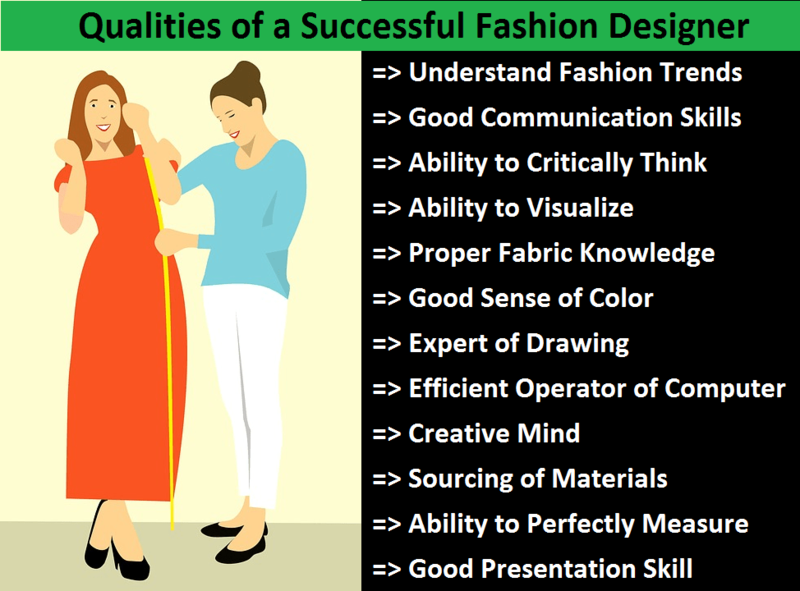 For a successful fashion designer, it is required to have the qualities of critical thinking. Always think out of the box so that new things may generate. So that marketers can offer new stylish garments items. For the fashion show, or for designing store layout, visualization of ideas and then implement accordingly is one of the key tasks of a fashion designer. A successful fashion designer has the ability to visualize. Visual effect generates more customer attraction. Without fabric, you cannot make any cloth. So the first thing is you need to collect your required fabric. Proper knowledge of fabric has you to identify and select the right fabric for your cloth. You may acquire knowledge of fabric from the export who always deals with fabric. At the time of buying fabric it is required to select the right materials otherwise your garments item may not give your expected comfort. Color is one of the main factors which actually attract the customer. Color may vary according to the season, occasion, taste, and gender. Before making a fashionable cloth you need to keep in mind all these factors otherwise your objective may not be fulfilled. Fashion designer always works with a new design; before final design, they work with the sketch. 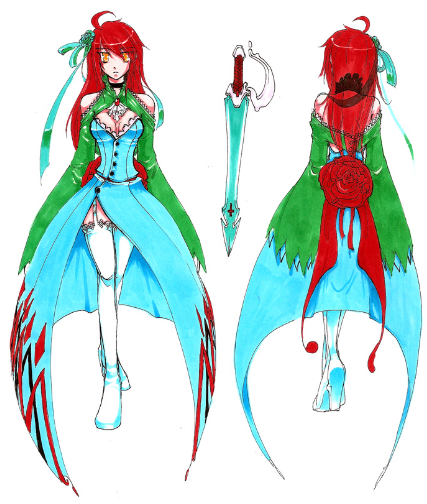 As a fashion designer if you can draw whatever you want then it will add extra value to your other qualifications. Through practice, you can be an expert at drawing anything. The new different software is available for designing cloth or drawing sketch. Good knowledge of computer and designing application software will make your job easier. You can use adobe illustrator, Autodesk or any other applications. Your Creative mind will help you to develop a new product which may create enormous demand in the market. Ultimately you will gain because of your demand. So if you are planning to become a fashion designer, first of all, think whether you have a creative mind or not, then decide what you should become. To make your fashionable cloth you will be required to source and collect fabric, trims and accessories and any other materials. So proper knowledge of these think should be there otherwise your garments will be as good as you were thinking. Also, the cost of your fashionable cloth will be increased which is not expected. Based on your least cost fashionable cloth your market demand will dependent. A good finish product depends on the proper cutting of fabric and for proper cutting, a perfect measurement is required. So as a fashion designer you need to have the ability to perfectly measure each and every component of making a dress. After making fashionable cloth if you are interested to offer it for the customer or you want to attend a fashion show then you must have a good presentation skill of presenting your products to the audiences. A better presentation skill will make your product more attractive and people will order your design. Tagged 11. Ability to Perfectly Measure, 12 Qualities of a Fashion Designer, Ability to Critically Think, Ability to Visualize, Creative Mind, Efficient Operator of Computer, Expert of Drawing, Good Communication Skills, Good Presentation Skill, Good Sense of Color, Knowledge of Sourcing of Materials, Proper Fabric Knowledge, Qualities of a Fashion Designer, Qualities of a Successful Fashion Designer, Qualities of Fashion Designer, Team Worker, Understand Fashion Trends, Understand Market Demand.